The Outpost, uploaded into Flickr by Kevin Macleod. Click on pic to see it in Flickr. "This photograph was taken from within an old military outpost in the Marin headlands. The outpost is part of a bunker installation set up during the second world war, designed to watch for Japanese ships coming from the east towards San Francisco. Ever since the end of the war, these bunkers have been all but abandoned, save for the taggers whose marks adorn every inch of this photograph." And lastly...I could not resist embedding Aimee's live performance below. She is such a songwriting talent. Hope you enjoy it!! 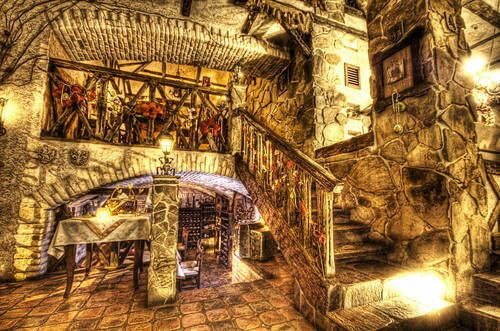 The Secret Ukrainian Underground Restaurant, uploaded into Flickr by Stuck in Customs. CLick on pic to see it in Flickr. Pretty cool shot here. 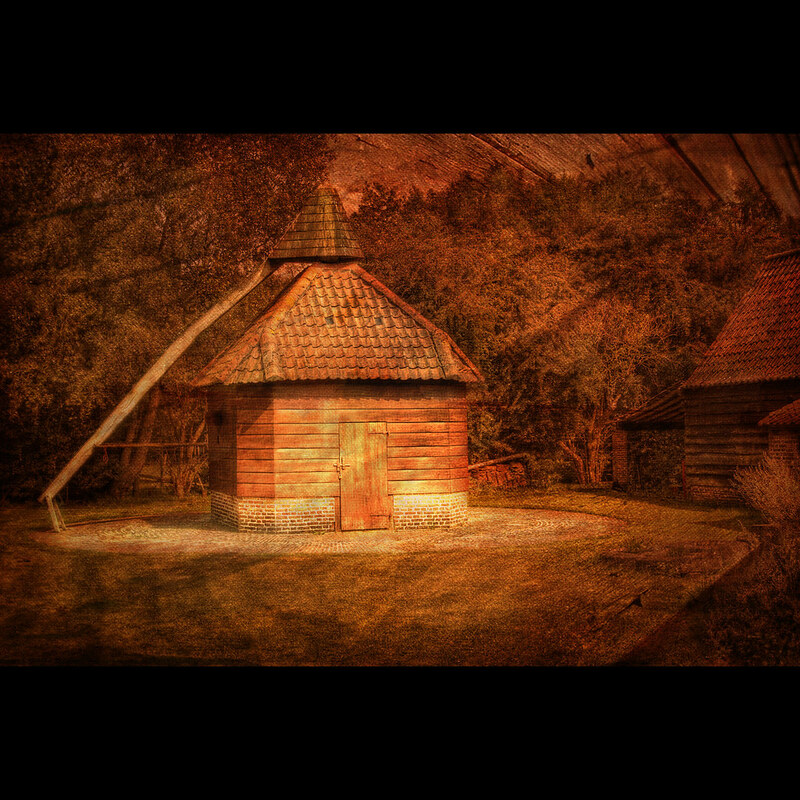 Shows that characteristisc HDR dream-like vision so often achieved by stuckincustoms. REALLY COOL IN LARGE ON BLACK. Chapel, uploaded into Flickr by iceman9294. Click on pic to see it in Flickr. 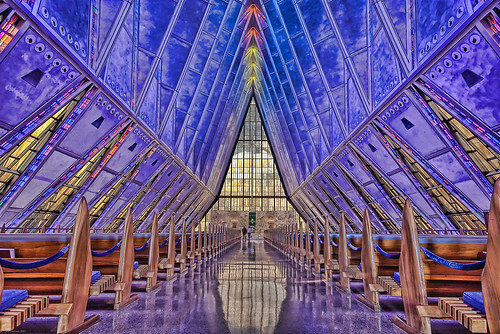 This is the United States Air Force Academy Chapel. What a cool building!! GOTTA SEE THIS IN LARGE ON BLACK. While this HDR shot is pretty oversaturated, the walls of the Chapel evidently do take on this violet color inside because of blue and red stained glass windows (see other pics of it from iceman9294 HERE and HERE). Quite the architectural statement for the AIr Force I'd say. Designed by Walter Netsch and built in 1958 (I am mildly surprised by that date), it is now a National Historic Landmark. I would guess it's Mr. Netsch's most enduring masterpiece, but it is very unlike his usual designs...I found out that he was a prominent brutalist architect, and I realize now that I pretty much despise brutalist architecture, as it's the reason there are so many screwed-up, cold, concrete monoliths on various University and Government campuses....like this Netsch design for the library at Northwestern University...ugggh!! 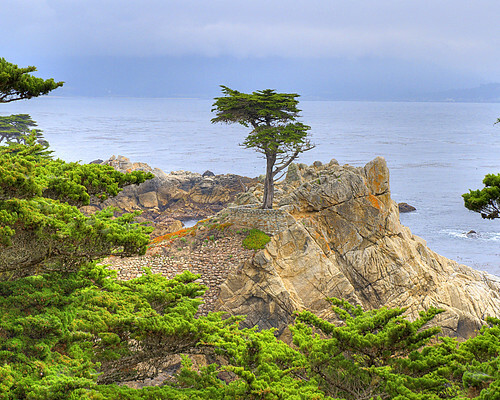 Pebble Beach, uploaded into Flickr by michaelstano. Click it to see it in Flickr. I suppose the Lone Cedar is quintessential California. I have not seen it in person because darkness fell before I could get there one day...the only day I could have done it. Oh well...this will have to do 'til I get close again. WELL WORTH IT IN IN LARGE ON BLACK. 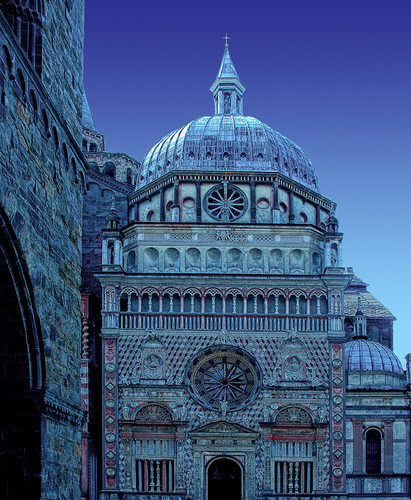 Bergamo... Cappella Colleoni... Evening..., originally uploaded into Flickr by egold. CLick on pic to see it in Flickr. 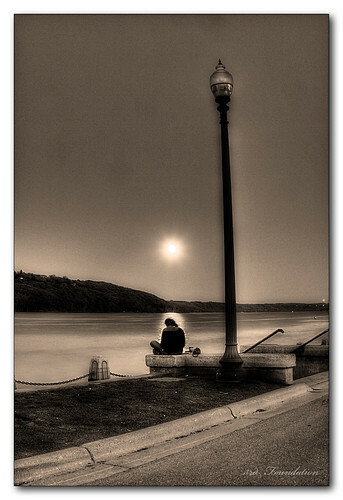 "Moonlight" yielded huge numbers of great HDR photos. Had to narrow it down though, and chose the one above. It's nearly flawless (And it's EVEN BETTER IN LARGE ON BLACK). But I was so struck by the one below (though it has some noise and other imperfections), I just couldn't eliminate it, and I am posting it as an honorable mention. I believe it's also better at this size. So I will leave it be. Reading by Moonlight. Uploaded into Flickr by 3rd foundation. Click on pic to see it in Flickr. Brugge @ Night, originally uploaded into Flickr by avdstelt. Click on pic to see it in Flickr. Still reading Bill Bryson's Neither Here Nor There, Travels in Europe. Brugge, Belgium sounds like an amazing place that's like stepping backwards in time. And this is a high quality HDR shot that really shows what HDR can do in challenging exposure conditions. Puts you right there. SEE IT LARGER ON BLACK. Another World, uploaded into Flickr by Further to Fly. Click on pic to see it in Flickr. Through many searches I've seen several HDR shots of this same slot canyon located in the Navajo Nation in Arizona, and they are usually unimpressive. You'd think it was a perfect venue for HDR, but it must be a tricky place to get a good one for some reason. However, this one is an exception and appears to be very well done. Like most of these posts, YOU REALLY NEED TO SEE IT IN LARGE ON BLACK. 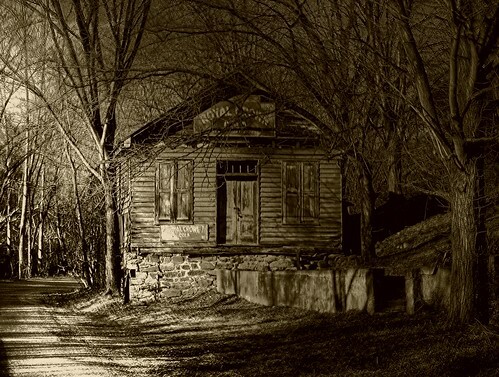 Memory Lane in Sepia, originally uploaded into Flickr by LynchburgVirginia. Yes, HDR processing works well in black & white and sepia. I have ended up selecting a number of LynchburgVirginia's shots in past posts. This is a nice one, and is, as typical of his shots, a mixture of calm with a tinge of uncertainty. GOTTA SEE THIS IN LARGE ON BLACK. Stormy City. Originally uploaded into FLickr by griffsflickr. Click on pic to see it in Flickr. I'm a J.J. Abrams fan so I had to see Cloverfield over the weekend. It wasn't bad...better than most in its genre, which I suppose is almost limited to the The Blair Witch and Godzilla. You'll definitely fare better if you go in with the mindset that you're there to roll with the "adrenalin of confusion" rather than having to understand what is happening. Anyway...the final scenes are played out here in Central Park. Here's the Cloverfield Monster taking out a building. Yeah, well maybe not, but his hair is pretty scary. But I digress...back to the above photo...I was pretty impressed by it. It's definitely one of those HDR shots that comes out looking more like a remarkable oil painting than a photo. A MUST SEE IN LARGE ON BLACK!! The two towers, originally uploaded in Flickr by grantthai. Click on pic to see it in Flickr. Very cool perspective on the Petronas Towers of Kuala Lumpur, Malaysia, which were at one time the tallest buildings in the world. Really comes to life when you LOOK AT IT IN LARGE ON BLACK. 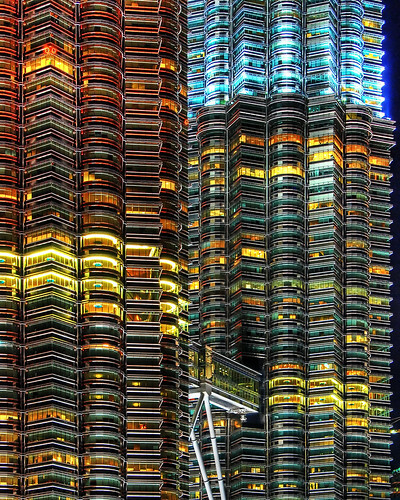 For more on the Petronas Towers and other large buildings try this link. Melkøya by night. Uploaded by Ingus. Click on pic to see it in Flickr. Been reading Bill Bryson's Neither Here Nor There, Travels in Europe. A really fun read, and I was particularly taken by his hilarious account of his 34-hour ride from Oslo to Hammerfest, Norway on the "Express 2000" bus. Once onboard, it all made sense to him as he read the bus' brochure that the trip to Hammerfest was 2000km...nonstop. "We were now as far north in the world as you could get by public transport. Hammerfest is almost unimaginably remote. 1,000 miles north of the Shetlands, 800 miles beyond the Faroes, 200 miles north of the northernmost tip of Iceland...I was closer now to the North Pole than to London. The thought of it roused me, and I pressed my nose to the cold glass....We approached Hammerfest from above, on a winding coast road and when at last it pivoted into view it looked simply wonderful--a fairyland of golden lights stretching up into the hills and around an expansive bay. I had pictured it in my mind as a village-- a few houses around a small harbour, a church perhaps, a general store, a bar if I was lucky--but this was a little city. A golden little city. Things were looking up." So "Hammerfest" was the search word today because I really wanted to see this town. I figured I'd see HDR photos of the town center, the harbor, some snow, but what came up was exactly ONE pic....the above pic (A MUST SEE IN LARGE ON BLACK)...and it appears to me to be exactly what Bill Bryson described. So to say I am satisfied with this search is an understatement. One pic...and I see exactly what I had been reading. I think I'll take it. Glowing Icons of Gesu Nuovo. Uploaded into Flickr by Stuck in Customs. Click on pic to see it in Flickr. From a church in Naples Italy. Stuck in Customs does it again...with an eerie one (note the skulls). To get the effect, you GOTTA SEE IT IN LARGE ON BLACK. 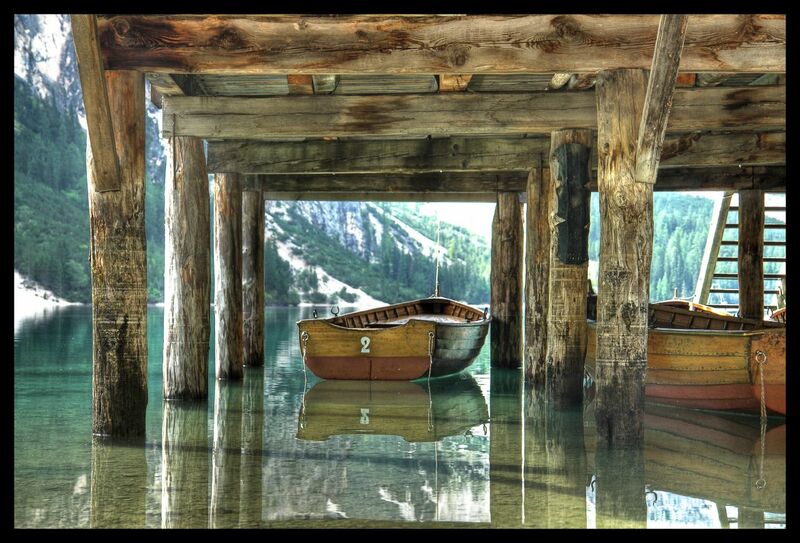 Lago di Braies - 1. Uploaded into Flickr by diedm. Click on pic to see it in Flickr. Very cool composition here, and the exposure range necessary to simultaneously bring out everything in the light and in shadow is huge. Without HDR techniques, I think this would be an impossible photo. GOTTA SEE IT IN LARGE. A Night At The Opera. Uploaded into Flickr by lightgazer. Click on pic to see it in Flickr. 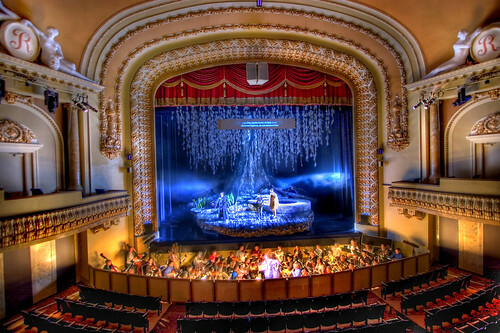 Amazing detail pops right out of the walls, trim, and stage production in this old theater in Victoria, British Columbia. Please have a look at it IN LARGE ON BLACK. Vay nice! Megeve calvaire. Uploaded into Flickr by delmez92. Click on pic to see it in Flickr. No intro or discussion needed here...it's tme to just gawk. AWESOME IN LARGE ON BLACK. Darkness invades the kingdom. Uploaded into FLickr by joiseyshowaa. Click on pic to see it in Flickr. Lot's of great pics came up with this search, but I chose this one because I have been to this castle, Hohenschwangau, in the Bavarian Alps in southern Germany. Gotta see it IN LARGE ON BLACK It's one of many that the Kings of Bavaria built in this area in the 19th century. This one is unique though because it was rebuilt the ruins of a castle that dates to the 12th century. Certainly an ideal spot for one. The HDR really enhances foreground detail, and, of course, the cloud treatment it renders creates mood. Wine, Dine & Unwind. Uploaded into Flickr by _uncommon. Click on pic to see it in Flickr. Yeah, I think could unwind here (I believe it's the western coast of Sweden). But when I saw it IN LARGE ON BLACK, I knew I could. angels come. Uploaded into Flickr by LynchburgVirginia. Click on pic to see it in Flickr. LynchburgVirginia always has those pastoral shots with a calming effect. Even better IN LARGE ON BLACK. Secret Passageway. Uploaded into Flickr by Stuck in Customs. Click on pic to see it in Flickr. What can I say?...simply another fine HDR from Stuck in Customs. Gotta see it IN LARGE ON BLACK. But here's my favorite from it IN LARGE ON BLACK. Hvalneshorn 3. Uploaded into Flickr by omarrun. Click on pic to see it in Flickr. Anyone who reads this blog a lot knows of my love affair with Iceland (great shots of it keep coming up), even though I have not been there. You can see and feel the misty chill ferocity in this one. HDR really make this photo pop, as it almost seems to move. GOTTA SEE IT IN LARGE ON BLACK. Kudos to omarrun on a great capture here. Every time I see another great pic from Iceland, it steels my resolve to someday go and see it first hand. Boat Row. Uploaded into Flickr by worldwidewandering. CLick on pic to see it in Flickr. Sat down to blog tonight, and in listening to The Slip's Eisenhower CD (a really super CD by the way) I suddenly knew what to use as a search word. This pic came up and stopped me in my tracks. Pretty darn neat, this one (TERRIFIC IN LARGE ON BLACK). Takes me right back to my youth, and fishing with my father in Southport, NC. He painted scenes like this in oils. I miss him. And now I'll remember him fondly whenever I listen to The Slip. That's pretty neat, too. Maroon Bells. Originally uploaded into Flickr by jcastle1343. Click on pic to see it in Flickr. As you can see from the archive of search words, every now and then I use a color as the search word. The search word today was "maroon." Evidently nobody takes HDR photos of anything maroon except a mountain range in Colorado named Maroon Bells. Almost every shot in this search was a view of them. Its a good thing it's a lovely view. I liked the doublet yesterday, so it's two pics again today... both from virtually the same location. Above is a color shot and below a black and white. I often think Black and white HDRs are superior, but the black and white shot below has some noise in the shadows and clouds, but I like the foreground and the contrasty mood. The color one above has amazing reflections. The ripples on the water are interesting because the mountain itself has ripple like patterns. It seems almost as if the real mountain "reflects" the ripples in the water. Contrasting Simularities. Originally uploaded into Flickr by jaylarson. Click on pic to see it in Flickr. The bridge. Originally Uploaded into Flickr by Wolfgang Staudt. Click on pic to see it in Flickr. PHOTO 1 (above) IN LARGE ON BLACK. PHOTO 2 (below) IN LARGE ON BLACK. Contemplation at the "cour d'honneur" HDR. Originally uploaded into Flickr by David Giral. Click on pic to see it in Flickr. The Moulin Rouge. Originally uploaded by Dimitri Depaepe. Click on pic, see it in Flickr. Thought "change" was an obvious chioice for the word of the day. Amazing how every candidate worked that word into their speeches last night afte the Iowa caucus...over and over. The pic above that resulted is a mill in Brugge, Belgium. Gotta see it IN LARGE ON BLACK. It's a bit mysterious, and it sorta makes you want to know more about it...kinda like the candidates. Snow! Originally uploaded by mabufeu. Click on pic, see it in Flickr. Had flurries here today just as a tease. We need some real snow. 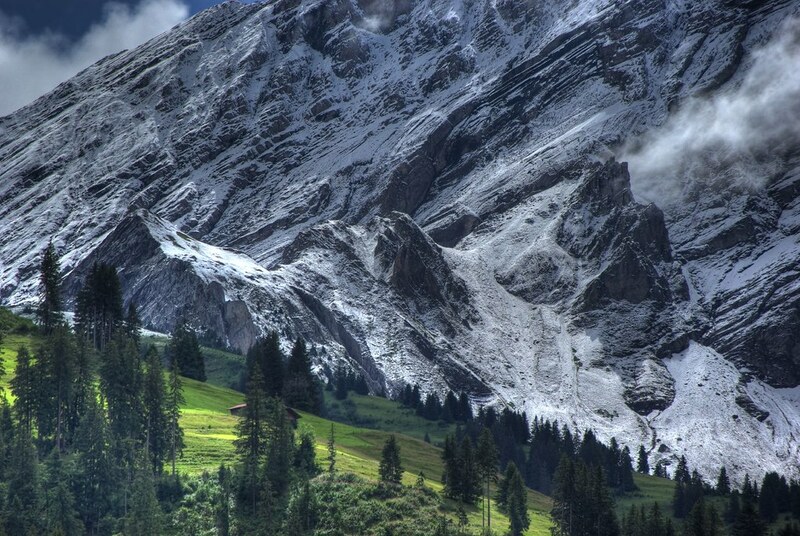 Found this terrrific shot taken in the Swiss Alps. Not really all that impressive UNTIL YOU SEE IT IN LARGE ON BLACK, then the mountain really looms. Great lines of perspective too. 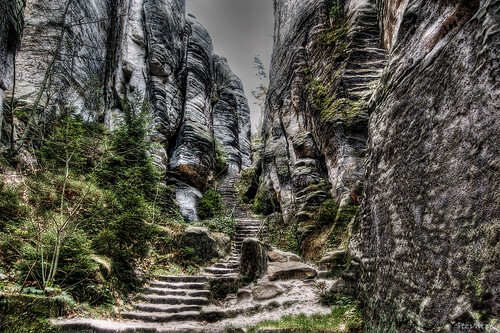 Cisarska chodba/Emperor's Passage - Prachov Rocks, originally uploaded by stevacek. Click on pic, see it in Flickr. After a long uninterupted run, and then a long hiatus (sorry for the extended absence), I resolve to return to keep this thing up again. I am in good cheer, though this pic does not exactly exhibit that characteristic. My mood is more like this pic, which is classic valpopando, but alas, it is not one that is available in large size. So the above, while not the cheeriest, was the most striking of the bunch for today's search word, especially in large on black...and as a wintry alternative, here it is in the snow. Thanks, stevacek, for helping start the New Year with these shots. Here's wishing everyone a great 2008! !